When we talk of desserts lending protein to your daily diet, milk and its products and nuts are the major sources. Protein rich desserts are very easy to make but the problem with desserts is that they are prepared using too much of fat and sugars. But here in this section all the sweets and desserts are prepared using minimal amount of sugar and fat. Healthy ingredients like Walnuts, Almonds, Paneer that give good amount of protein and calcium are used. 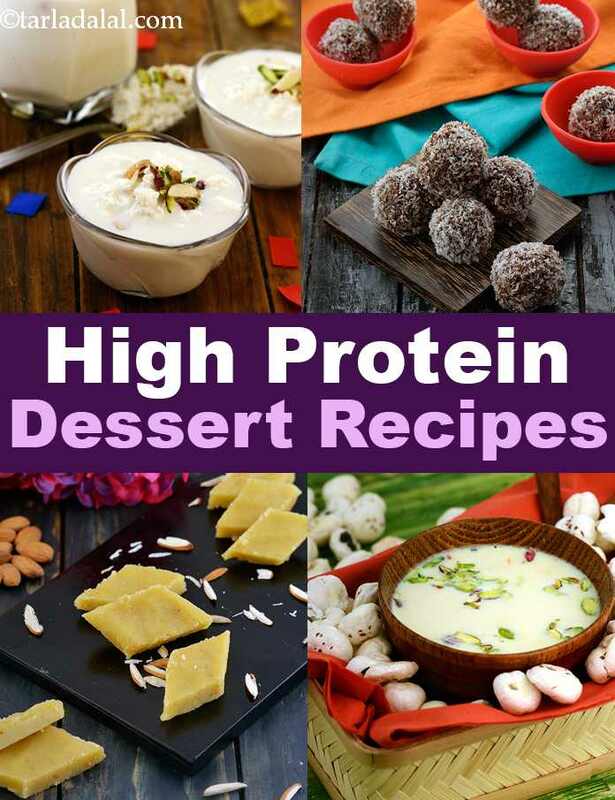 Do try your hand at these protein enriched desserts but remember to not go overboard as well! High protein nuts have been used to put together recipes like Almond Sheera which is rich in omega-3 fatty and is considered as brain food since ages. It is also rich in protein and iron that too boosts the brain power. Walnut and Cashewnut Balls can be used as healthy finger food for kids made of calcium and protein rich walnuts. These are a huge hit for both kids and adults. Badam Barfi is a healthy barfi which is better than the regular barfi as it uses very little ghee and sugar in its preparation. These tasty Peanut Butter Coconut Balls are also healthy as they are rich in protein and good fat. It can also be enjoyed occasionally as a dessert by weight-watchers. From North Indian style Makhane ki kheer to Apple Rabadi of the West of India to South Indian style Carrot and Cashewnut Payasam, you will find all the varieties in this section. While other dairy products like paneer have been used to whip up recipes like Coconut and Paneer Puranpoli and Paneer Kheer. Orange Sandesh a Bengali delicacy that will surely become one of your favourite desserts of all time. It has paneer which is a good source of paneer and fresh orange juice adds to the flavour and yummy taste. Walnut Sheera is a unique sheera made with walnuts! Walnuts are rich in Omega-3 Fatty Acids that are good for the brain cells. It also abounds in the antioxidant vitamin E, which helps the body to get rid of harmful free radicals. Fruity phirni, a variation of rice phirni - soft in texture and pleasant to taste, it poses no problems for the elderly to consume. Roasting poha brings out the taste as well as makes it easier to grind.